We were finalizing our MDTs (Max Disaster Tours) with a non-diaster, at least not an apparent one, just the typical Middle Age bloodshed. We were headed to Ghent, the largest city in Flanders (Belgium) during the Middle Ages thanks to cloth, where we landed for two nights and one full day. Our hotel, which included a tiny kitchenette, sat conveniently within the historic center one block from Vrijdagsmarkt Square or “Friday Market Square”, so-called from, you guessed it, hosting Friday markets beginning in 1199. Amidst the shops and cafes a pointing statue dominated the square, which turned out to be the city’s famous citizen, Jacob van Artevelde (1290-1345). You know this area of the world during the Middle Ages was raking in the dough from cloth. So much cash was being generated that Ghent, along with Bruges and Ypres, were floating in wealth. Those making this possible were the Guilds, specifically the Cloth Guilds. They’d import English wool, weave it, and sell it back as finished cloth. A wonderful and tidy circle of funds created a wonderful and productive income for all, well, at least for the owners and higher-ups. and King Edward III of England. Louis left a power vacuum, and in steps Jacob, a wealthy man, who now becomes a prominent business leader in the city. But, back to the power struggle… Why the King of England would claim ownership to a French throne is due to an unclear line of succession. The French King Charles IV died in 1328 without a male heir. There happened to be a widow, but, no surprise, her title didn’t count. 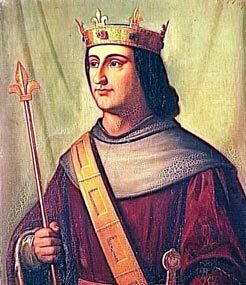 Philip, a cousin of Charles IV, however, became regent and was then crowned king when the widow-queen begat a daughter, not a son. 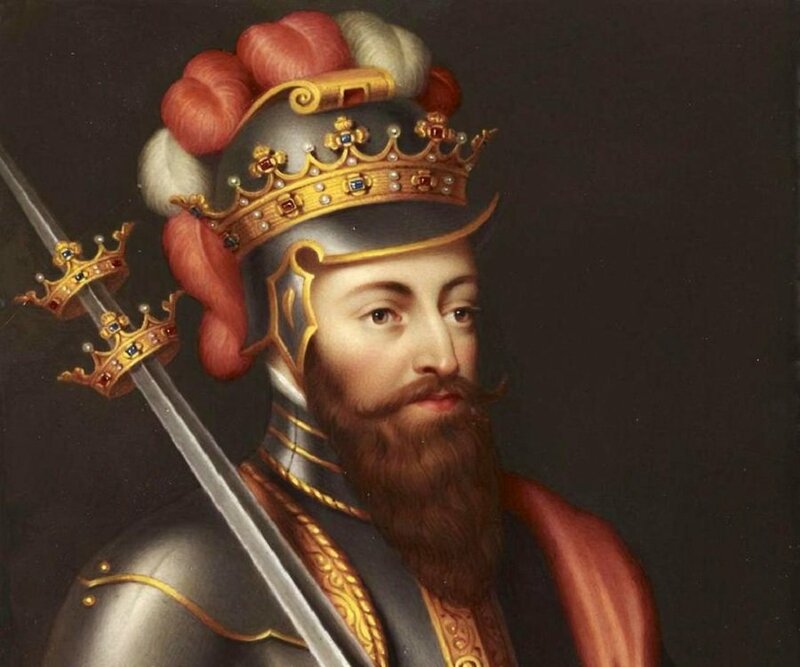 But, whoa, here comes England’s Edward III, King of England as well as a vassal of France (ever since the Norman Conquest in 1066 by William, the kings of England are also dukes of Normandy, which further adds spice to this French-English monarchy stew.) Seeing an opportunity to expand his realm, Edward states his claim to the French throne via his mom who happened to be the daughter of Philip IV, a previous French King. Well, Philip VI and Edward III ended up sniping at one another resulting in Edward III boycotting Flemish cloth. Well, as we know, money Trumps all. Jacob, the one immortalized in the Friday Market Square statue, convinced the Federation of Guilds to back Edward III. After all, that’s where the all mighty dollar lay (and why this 19th century statue is pointing towards England). FYI: Historians say this is the beginning of the Hundred Years’ War (1337-1453), a war of constant back-and-forth with England and France fighting over who’s going to sit their royal hinny on the French throne. Returning to our rebellious Jacob, he didn’t do so well in the end. He became unpopular among all the Cloth Guilds and ended up being hacked to death by the head of the Weavers Guild in 1345. But, hey, he still has an imposing monument in one of Ghent’s beautiful squares. Leaving Jacob behind we continued our self-guided walking tour. Ghent is a lovely city but definitely a city with an modern, urban feel if you step foot outside the historic district. Yet, within the confines of the medieval cobblestone streets and squares magnificent buildings abound. and some not so easily id’ed such as these frolicking figures danced their way across a roofline (it turned out to be the Mason’s Guild Hall). One of the most noticeable buildings is the Cloth Hall and its Belfy. In 1313 the people of Ghent decided to build a tower as a symbol of independence, and the Belfry was constructed. Approximately 600 years later the flying dragon was added to its peak. Remarkably, the civic privileges from 1180 still reside here under heavy guard. Another symbol of town pride is the huge brass drum in the belfry belting out tunes. We took a stroll around the balcony circling the tower obtaining some city views. Let me rephrase that: Max took a stroll. I, on the other hand, stuck to the stone wall with my back never leaving it until I scurried from one portico to the next all the time thinking ‘this, too, will pass’. 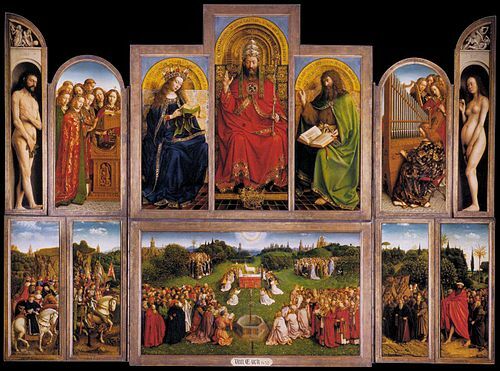 A ‘you-HAVE-to-see-this’ piece of art awaited us at the Cathedral of St. Bavo; and, it was definitely worth seeing. 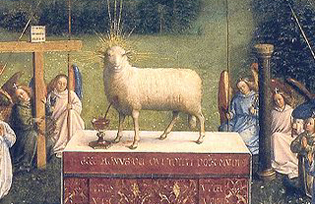 “The Adoration of the Mystic Lamb” (the neck-bleeding lamb symbolizes crucified Jesus dying for mankind’s sins) was painted by two brothers, Jan and Hubert van Eyck (1420s-32). Jan, whose patron happened to be Philip, Duke of Burgundy, is credited with being the father of oil painting; and, if you’re like me wondering what did they paint with if not oil, it was the ‘tempera method’, pigments bound together with various liquids, the most popular one being egg (to which they would sometimes add myrrh to offset any offending odors…). To view this momentous work we were ushered into a tiny room, which quickly filled up as more and more visitors filed into an ever-increasingly small space. But, we could still see it, and with an audio guide learned something about this piece of art composed of twelve panels painted front and back. The NEW YORK TIMES recently covered the ongoing restorations, so it was fascinating to see it in person. to where we spotted a small courtyard enticing my husband to perform his obligatory peep, this time into a medieval well. In another plaza we mingled with tourists and locals alike as the afternoon morphed into twilight. The second and last morning we had our first meal out in Ghent (all others being picnic-style in our room). Consisting of dual cups of excellent coffee and freshly baked items, our breakfast not only provided nourishment but also an opportunity for Max to snap me at my best. After feasting on freshly brewed java and aromatic croissants we drove back into the Netherlands with a planned stop at an engineering marvel, the Maeslantkering, a moveable storm surge barrier. As one of the 13 components comprising the North Sea Protection Works, this surge barrier is the largest in the world. A display featured an explanatory exhibit (all in Dutch so we basically gazed at the models while scratching our heads) demonstrating why it was constructed (the devastating 1953 flood and the potential for more) and how (for engineering brains). After the indoor explanations, we headed outside to get an overview of the site and the immense floating arms. all while a cold wind buffeted us, hence the shoulders clenched to the sides and hands stuffed into coat pockets. Back in the car we commented on how cool it’d be to actually witness the annual-test closing of the gates. Hmmm… another road trip! Next: ’tis the season in Netherlands! This entry was posted in 2016 11 BELGIUM, 2016 Winter Tours, Belgium, COUNTRY, Europe, WINTER TOURS on January 10, 2017 by margaretlynnie.